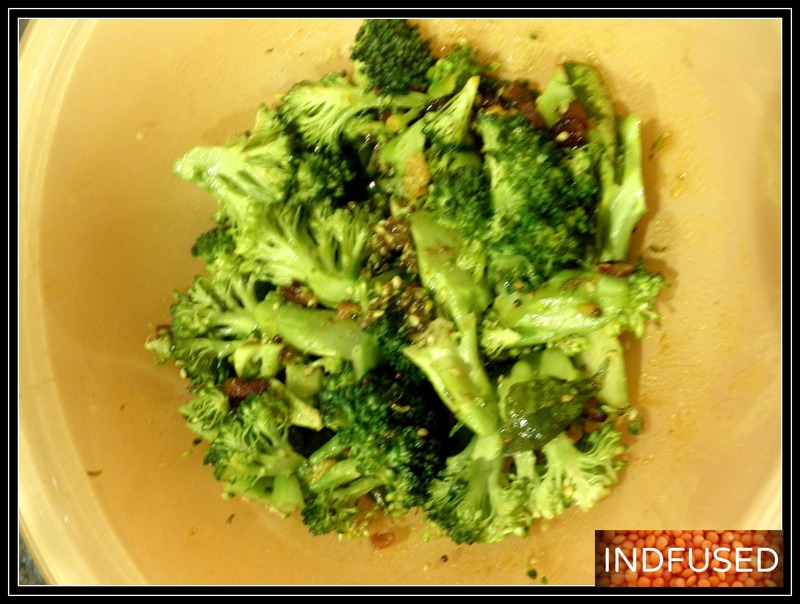 Nutritious Broccoli Zunka in 7 minutes! Recipes passed down the generations are my treasured heirlooms. They have been passed down from my grandmothers to my mother and from my incredibly talented mother, to me. I have modified some recipes so they are easy to make in today’s hectic world and are also healthier versions to fit our changing lifestyle. And you know me! I am not willing to compromise on the original taste of these dishes. Zunaka is one such dish. Some of the other dishes that I have posted like rice bowl with fish curry , Pithaley and rice bowl with potato curry are also heirloom recipes that I have simplified. 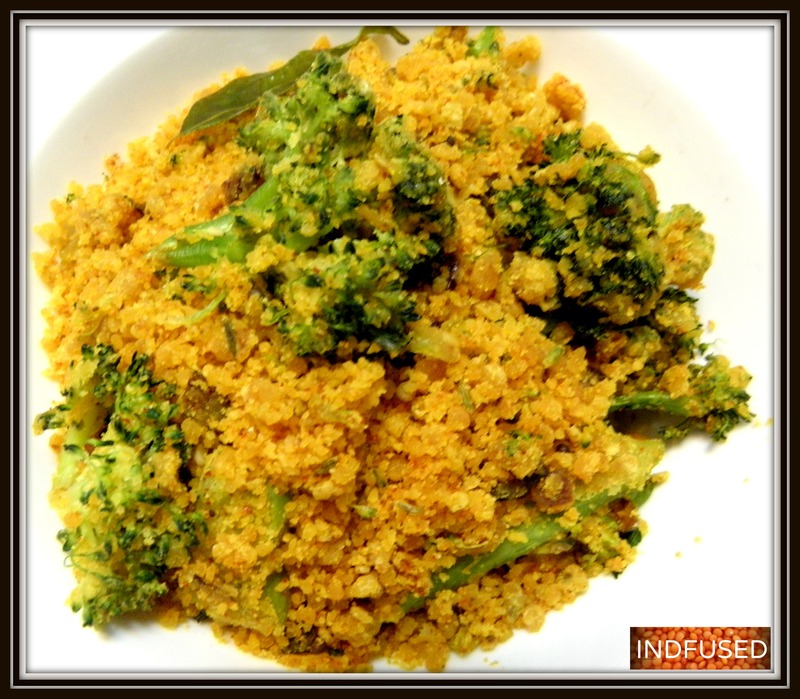 Zunaka is a vegetable dish that is very popular in Maharashtra, India. Mention Zunaka to any Maharashtrian and they will tell you that it is the most down to earth food that they can think of. Zunaka is a staple food of the farmers and for folks living along the country side and is eaten with warm and toasty bread called bhakri. Zunaka is made generally with some fresh greens like scallions which are spiced and combined with besan or gram flour, which adds the protein content to the dish. I have used broccoli here as I like the texture of the crisp broccoli in the zunaka, not to mention it being nutrient rich. Fennel seeds and amchoor (dried mango powder) are not traditional to Maharashtrian cuisine but I love how these two ingredients juxtapose with the taste of besan. Enjoy this quick and easy 7 minute microwave recipe that I am glad I developed ! My family loves it so much that I get asked to make it again and again! I hope your family enjoys it as much as mine does. In a microwave safe bowl, combine the 1½ tablespoon extra virgin olive oil with the next 11 ingredients. Microwave on high for 2minutes. My pictures are not that great, but they will give you an idea of what the mixture looks like. And after 2 minutes ! 2. 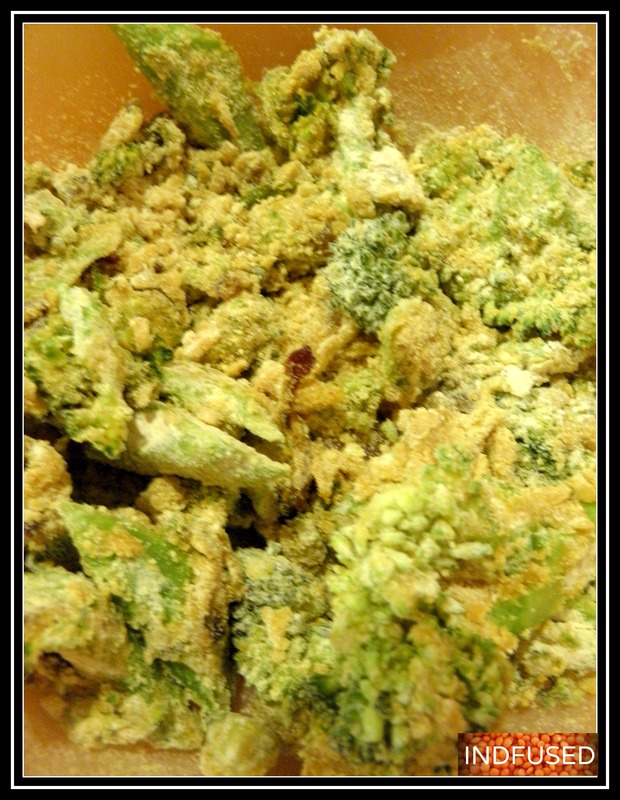 Add the broccoli, salt, brown sugar and amchur powder . Mix well and microwave again on high for another minute. 3. Add the combined besans and mix well. 4. Microwave the mixture for 2 minutes on high. Stir well and microwave for another minute. 5. Drizzle the zunka with 1 teaspoon of the extra virgin olive oil and microwave for one minute more. 7 minutes total in the microwave! Writing to my dream reader! Wow this looks delicious! Thanks for sharing the recipe Sandhya! Thank you so much Loretta for your kind words and for the information. I did start the Blogging 101 course after you sent me the information but have not been able to keep up. Will try to catch up! This looks lovely! I love to read about family recipes and how they are handed down, with each generation adding a little change to make it work for them. Thanks for sharing! Thank you Ginger! Yes I love heirloom recipes too! there is something so warm about the next generation enjoying the recipes that were handed down for so many generations before us. I love the zunka , bhakri and thecha too!